What is the upstream oil & gas industry? How are oil & gas resources discovered? What jobs are involved in drilling a well? When you fill up your car with gasoline or pay your natural gas heating bill, you are the final link in a long chain of businesses that make it possible for us to enjoy these clean, convenient and economical forms of energy. The entire chain is known as the petroleum industry. However, the industry is usually divided into three major components: upstream, midstream and downstream. The upstream industry finds and produces crude oil and natural gas. The upstream is sometimes known as the exploration and production (E&P) sector. Because Alberta accounts for more than 80 per cent of Canada’s oil and gas production, many upstream businesses are based in Alberta and most have their head offices in Calgary. The midstream industry processes, stores, markets and transports commodities such as crude oil, natural gas, natural gas liquids (NGLs, mainly ethane, propane and butane) and sulphur. The midstream provides the vital link between the far-flung petroleum producing areas and the population centres where most consumers are located. 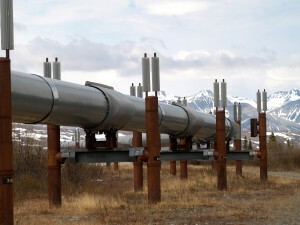 In Canada, transmission pipeline companies are a major part of the midstream petroleum industry. Most of these companies are also based in Calgary, although their activities extend across the country, into the United States and sometimes abroad. The downstream industry includes oil refineries, petrochemical plants, petroleum products distributors, retail outlets and natural gas distribution companies. Although many downstream companies are headquartered in Calgary, the largest centres of activity are near Sarnia, Ontario, and Edmonton, Alberta. The downstream industry touches every province and territory-wherever consumers are located-and provides thousands of products such as gasoline, diesel, jet fuel, heating oil, asphalt, lubricants, synthetic rubber, plastics, fertilizers, antifreeze, pesticides, pharmaceuticals, natural gas and propane. The upstream petroleum industry in Canada includes more than 1,000 exploration and production companies as well as hundreds of associated service businesses such as seismic and drilling contractors, service rig operators, engineering firms and various scientific, technical, service and supply companies. Upstream industry revenues totaled $63 billion in 2000, of which 53 per cent came from the sale of crude oil. The remainder was from sales of natural gas, natural gas liquids and sulphur. About half of Canada’s oil and gas production is exported to the United States. Canada is self-sufficient in natural gas-supplying virtually all domestic markets with domestically produced natural gas-but imports of crude oil into Eastern Canada account for about 40 per cent of the nation’s oil supply. The search for oil and gas begins with aerial surveys and surface observation by geologists and geophysicists to see if an area has the kind of the rock formations that might contain petroleum. Companies then conduct seismic surveys or purchase seismic data from other companies to get a better picture of the underground rock formations. In a seismic survey, the geophysical contractor’s crew lays out a line (or several lines) of sensitive receivers, called geophones or “jugs,” on the ground. Then explosions or mechanical vibrations are created on the surface. The geophones record the energy reflected back as seismic waves from rock layers at various depths. Geophysicists use powerful computers to process the data from digitally recorded seismic surveys. Computer-assisted processing of the data creates a picture of the sedimentary structures below and ideally shows the location and extent of porous layers within these structures. Geophysicists and geologists examine the seismic data for the presence of suitable traps and for similarities with other petroleum-producing areas. If the results seem promising, they use the seismic data to locate and drill a well. Because of long-standing and close cooperation among industry, government and academic scientists, Canada is regarded as having the most comprehensive information about its petroleum resources of any country in the world. Early requirements to record accurately all kinds of information from the 650,000 wells drilled to date in Canada have given us an extremely valuable and reliable database that can be used quickly and cheaply. Access to land, and the minerals beneath it, is required in order to drill a well. Oil company land departments negotiate access with owners and federal or provincial governments. Specialized staff, known as landmen (who may be male or female), are responsible for all these negotiations. No exploration or production activity can occur without the necessary permissions. About 75 workers are directly employed by the drilling of one well, although only four to seven may be on duty at the rig at any given time. The actual number can vary considerably, depending on the type of well being drilled. The rigs operate around the clock, seven days a week, and the crews typically work 12-hour shifts for two weeks and then have a week off. The workers sometimes live in a temporary camp on site. The only way to determine whether a rock formation actually contains oil or gas is to drill a well. There are about 690 active drilling rigs in Canada. Most rigs are owned by contractors who sell their services to exploration and production companies. There are many different types of drilling rigs. The smallest are mounted on trucks, while the largest are installed on ships or offshore platforms. Some are specially equipped for sour gas exploration, Arctic operations, slanted holes or horizontal drilling. As a general rule, the bigger the rig, the deeper it can drill. Land-based rigs can be quickly assembled and taken apart in sections for moving between locations, although this may require up to 50 semi-trailers for the largest. Drillers call drilling making hole. The basic process is simple. A revolving steel bit at the bottom of a string of pipe grinds a hole through the rock layers. The bit may be studded with tungsten carbide or industrial diamonds to reduce bit wear and penetrate harder rock formations. A fluid called drilling mud lubricates the bit, removes cuttings, conditions the well bore and stabilizes the pressure in the hole. The mud, a suspension of chemicals and minerals such as bentonite clay in water or sometimes oil, is pumped down the drill pipe. It circulates back to the surface through the space outside the pipe, known as the annulus. The mud recirculates after cuttings are removed by a vibrating screen called the shale shaker. Occasionally, wells are drilled without mud to increase penetration rates and to avoid contacting sensitive rock formations with water. In so-called air drilling, compressed air removes the cuttings. Alternatively, drillers can obtain many of the same benefits through underbalanced drilling-using mud lightened by the addition of nitrogen or other gas. Underbalanced drilling has become increasingly common in western Canada because it minimizes damage to the producing reservoir. This is especially useful in clay formations. Clays can collapse into the well bore or swell up when contacted with fresh-water-based drilling fluids. Underbalanced drilling prevents the invasion of the drilling fluid into the reservoir and allows oil to be produced more effectively. As the bit penetrates deeper, the crew threads additional pipe onto the top of the string. Sections of pipe are typically 9.5 metres long, but may be longer. Pipe diameters and wall thickness vary, depending on well depth. On most land-based rigs, a rotary table on the rig floor rotates the drill string to rotate the drill bit. However, most offshore units and an increasing number of land rigs use top drives-hydraulic or electric motors suspended above the drill string. In some situations, the bit can be turned by a mud motor, a downhole hydraulic drive which is inserted above the bit at the bottom of the string. It receives power from the mud flow. This is the technique used in horizontal drilling. Wells are normally drilled in stages, starting with a surface hole drilled to reach a depth anywhere from 60 to 400 metres, depending on final well depth and area conditions. This is called “spudding in” the well. The crew then pulls out the drill string and inserts steel pipe, called surface casing, which is cemented in place to keep the wall from caving in. It controls the return flow of mud and other fluids encountered during drilling and also prevents contamination of groundwater aquifers. Blowout preventer (BOP) devices are typically installed on the top of the casing, below the rig floor. BOPs are large valves that help contain the fluid and gas pressure in the well. One type of BOP can seal off the space between the drill pipe and the casing (the annulus) if the drill pipe is still in the hole. Another can shear off the drill pipe and thus seal off the entire well, while a third can seal off the well if no drill pipe is in the hole. If the well is likely to encounter high pressures, several of these BOPs may be mounted in a BOP stack. Contrary to the image portrayed in old movies, drillers do their best to avoid uncontrolled releases, known as “gushers” or blowouts. Blowouts waste valuable resources and often damage the environment. Some blowouts could release foul-smelling sour gas containing toxic hydrogen sulphide, which would be a major hazard for workers, nearby populations and environments. Blowouts can be enormously expensive to bring under control. Crews are trained to use BOPs and drilling fluid to reduce the frequency and severity of blowouts. Some wells are designated as critical sour gas wells because they have the potential for releases of hydrogen sulphide that might affect nearby residents. Companies and governments require emergency response planning, public consultation, safety equipment and worker training for critical sour gas operations. When the drill bit enters the critical zone in a well where sour gas will likely be encountered, additional precautions may include providing breathing apparatuses for rig personnel and notifying people living nearby. After setting surface casing and installed the BOPs, the crew resumes drilling. A probe for shallow gas or heavy oil in eastern Alberta or Saskatchewan may require only two or three days to drill 450 metres through soft shale and sandstone to the target depth. However, a rig may work eight months or more to penetrate 4,500 metres or more through hard, complex rocks in the foothills of the Rockies. The drill bit column may be several kilometres deep by the time high-pressure gas deposits are reached. The weight of the drilling fluid can be increased by adding heavy minerals such as bentonite clay to the mixture. Drillers try to keep the mud heavy enough to hold back gas from entering the hole, but not so heavy that the mud will penetrate into the reservoir enough to damage it. If the reservoir pressure is higher than the pressure exerted by the mud column, some gas may enter the well bore. This is known as a kick and must be controlled to prevent a blowout. Kicks are detected by sensitive instruments which monitor the mud flow and composition and the mud tank levels. Drillers control most kicks simply by managing the mud flow and increasing the weight of the mud. When a well is drilled, small rock chips called cuttings are recovered from the drilling fluid. These are pieces of rock ground up and broken off by the drill bit as it cuts into the earth. Geologists, geochemists and paleonologists (scientists who study pollens and small fossils) examine the cuttings to learn more about the age, chemistry, porosity, permeability and other properties of the subsurface rock formations. Larger, more continuous cylindrical rock samples, called cores, can also be cut using a special coring bit. Although coring adds to the cost of the well, laboratory analysis and visual examination of the core provide additional important details about the basin’s history, the composition and physical characteristics of the rock and any fluids contained within it. Throughout drilling, various logs are plotted to record the well’s progress, like a ship’s log. The record includes data about the type and thickness of rock layers, based on the wellsite geologist’s examination of cuttings brought to the surface during drilling. The speed of penetration is another indicator. The first sign of possible success is usually an increase in the rate of penetration followed by the appearance of oil or gas traces in cuttings. If more information is needed about the rocks, a special cylindrical bit may be used to cut a core sample for analysis by geologists, reservoir engineers, geochemists and paleonologists. Further information is obtained by lowering a package of instruments, called wireline logging tools, into the well bore. The instruments record and transmit information about the rock layers’ thickness, porosity and permeability and the composition of the fluids (oil, gas or water) contained in them. A logging instrument can also be mounted on the string above the bit to send information continuously during drilling. It sends signals to the surface by means of pulses, like sonar signals, in the mud. Another instrument, called a measurement while drilling (MWD) tool, can similarly measure the direction and precise location of the bit while drilling horizontal wells. Another common way to determine potential oil or gas production is the drillstem test, using a special tool in place of the bit on the end of the string. The tool has valves and rubber sleeves, called packers, that can be controlled from the surface. First, the packers are expanded to isolate the section of the hole to be tested. Next, valves on the tool are opened, allowing liquids or gas from the formation to flow into the empty drill pipe. This gives a good indication of the type and volume of the fluids in the formation, their pressure and rate of flow. If tests indicate the well is a dry hole, not capable of producing commercial quantities of oil and gas, the drilling crew plugs the well bore with cement and cleans up the site. A similar procedure is followed if a producing well is no longer economical to operate. After exploration has located a reservoir of oil or gas, the operating company’s production department takes over the task of supervising the services required to bring the resource to the surface. Oil is not produced from underground lakes. Rather, the oil is contained in the pores of certain sedimentary rocks in the same way that water is held in a sponge. Completion is the procedure by which a successful well is readied for production. The first step for most wells in Canada is the installation of production casing. Open hole completion, rarely used in Canada, does not use production casing. The casing-tubular steel pipe connected by threads and couplings-lines the total length of the well bore to ensure safe control of production, prevent water entering the well bore and keep rock formations from “sloughing” into the well bore. Production casing is cemented in place by pumping a cement mixture into the casing and forcing the cement back up the annular space, between the casing and well bore. The task must be done quickly but carefully, because a poor cement job can adversely affect the producing formation. Once the cement has set, the drilling rig is usually moved and a smaller, truck-mounted service rig is brought in to complete the well. There are about 870service rigs in Canada. They also return to wells periodically to perform maintenance, replace equipment or enhance production. The second step is the installation of the production tubing. Production tubing is steel pipe smaller in diameter than the production casing. It is lowered into the casing and held in place by packers which also isolate the producing layers of rock. The tubing hangs from a surface installation called the wellhead. The wellhead includes valves, chokes and pressure gauges, and makes it possible to regulate production from the well. The third step is to perforate the well. The casing prevents the hole from collapsing, but it prevents the oil or gas from entering the well bore. Therefore, holes are made through the casing and into the formation. This is usually accomplished with an explosive device that is lowered into the well on an electrical wireline to the required depth. This device, a collection of explosive charges in a special carrier, is called a perforating gun. An electrical impulse fires the charges to perforate the casing, surrounding cement and reservoir rock. While some oil wells contain enough pressure to push oil to the surface, most oil wells drilled today require pumping. This is also known as artificial lift. If a well requires it, a pump is lowered down the tubing to the bottom of the well on a string of steel rods, referred to as the rod string. The rod string is hung from the wellhead and connected to a drive unit and motor on the surface. The rod string conveys power to the pump either by rotating or moving up and down, depending on the type of pump employed. Submersible pumps are used on some wells. In many oil and gas wells, one additional step is required-stimulating the formation by physical or chemical means so that hydrocarbons can move more easily to the well bore through the pores or fractures in the reservoir. This is usually done before installing a pump or when the pump is removed for maintenance. Acidizing, one form of stimulation, is the injection of acids under pressure into the rock formation through the production tubing and perforations. Hydrochloric acid, for example, is particularly effective in dissolving portions of limestone and dolomite. This creates channels beyond the perforations for oil to flow back to the well. Fracturing or “fracing” is another common method of stimulation. A fluid such as water or an oil product is pumped down the hole under sufficient pressure to create cracks in the formation. A hard material-like sand, glass beads, aluminum pellets, even walnut shells-is injected with the fluid. As the fluid disperses, this material remains to prop open the cracks. Coiled tubing has been an important innovation in well completion and servicing. Coiled tubing is a jointless, high-pressure-rated hollow steel cylinder. Production tubing is traditionally made up of joined sections of pipe, similar to the string of pipe used for drilling; but coiled tubing is now also used in this application. It is brought to the wellsite on reels holding up to 19,000 metres. Special equipment is used to insert the tubing through the wellhead into the well bore. This method is considerably quicker and more efficient than joining sections of pipe. Coiled tubing has also proved useful in other applications such as well stimulation and under-balanced drilling. Coiled tubing can even be used with downhole motors (driven by mud circulation) for certain kinds of drilling such as horizontal re-entries. On the Hibernia platform off Newfoundland, coiled tubing is used for a variety of completion and servicing tasks. Saskatchewan’s online source for provincial maps and land information is ready for public use and is available at GIS.Saskatchewan.ca. Because it’s online, you can discover, visualize and download data whenever you want. Registration only takes a minute and it’s free to use. Centralized access to standardized mapping and land information from reliable and trustworthy government sources. Ability to view and integrate live and static geospatial data from a variety of sources using our Map Viewer web service. Free downloading from a wide assortment of GIS data products sourced from participating Government of Saskatchewan ministries and agencies. New data products and services are being added periodically as they become available. All natural gas production in Canada is connected to processing facilities and eventually to markets by buried pipelines. Some crude oil production is trucked to the nearest processing facility (called a battery) or pipeline terminal. Pipelines serving wells and facilities in the upstream petroleum industry are referred to as flowlines or gathering systems. Oil and gas companies operate more than 200,000 kilometres of flowlines and gathering systems in the producing areas of western Canada. These are relatively small pipelines-2 to 24 inches, or 50 to 600 millimetres, in diameter. About 60 per cent of the gathering lines in Alberta carry natural gas and natural gas liquids. Processing facilities separate the raw petroleum into marketable commodities and by-products. If the oil or gas contains sulphur compounds, it is termed “sour” and requires special equipment and procedures. Sulphur compounds are highly corrosive, so regular maintenance and inspection of pipelines are particularly important. There are about 6,000 kilometres of pipelines in Alberta carrying sour gas from about 2,000 producing sour gas wells. At gas processing plants, sulphur compounds and liquids are removed from natural gas through chemical and physical processes involving heat, cooling and catalysts. Plants handling large volumes of sour gas include sulphur recovery facilities to produce elemental sulphur for sale to the fertilizer manufacturers and other industries. Of the nearly 300 gas processing plants in Alberta, more than 60 are large facilities that produce elemental sulphur as a byproduct. The British Columbia sour gas industry includes three large sulphur recovery plants, four smaller field plants and more than 4,600 kilometres of sour gas pipelines. Found and produced along with crude oil are varying quantities of natural gas, known as associated gas or solution gas. This gas may be directed to processing plants or flared if quantities are too small to justify recovery. In the 1990s, there was a sharp reduction in the proportion of solution gas that is flared. This has been done to conserve economically valuable product and to reduce air emissions. What role does the petroleum service, supply and manufacturing sector play?